Works great! Only issue is the collar is a bit flimsy and not what we expected. Otherwise all good and the training video is excellent. Simple and easy to program. Great product! I had the Garmin Delta before and hated the electric screen! The Garmin Sport PRO is very easy to use with 2 dogs. I love the toggle switches and knobs and no electronic screen to break. The collars are very easy to use in every mode. I especially like the led lights for night use. "Great for my two dogs." 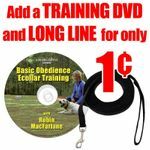 I found this training collar great for my two dogs, I can control them from one very easy to use remote. The great review and recommendation video that Gun Dog Supply had online was extremely helpful. I have purchased several products from Gun Dog Supply and found their customer service to be excellent. "Very simple and user friendly." These collars are great! Very simple and user friendly. The lights are a great bonus that I'm not use to. We love them. I have always bought tri-tronics and love the product. This new sport dog system is so light and easy to use. I highly recommend. "This is a great 2 dog system!" Nice collar system to work for 2 dogs. Didn't have any issues matching the extra collar up to the transmitter, and I'm a bit technologically challenged. Switching from 1 collar to the next on the remote is simple. Range is great. I'm a big fan of the locator beep and the vibration options as well. This is a great 2 dog system. Both dogs were off the leash within two weeks. Recall is consistent, so they can now run in the woods, etc. Our Cur was jumping on people and that has stopped. They are both more secure and extremely happy dogs! This product is fantastic! Just buy it! By the way, these guys are so helpful when you call and the products shipped promptly. I have to say I enjoyed giving this company my business, rather than the big stores!! These types of businesses are what makes America great! Have been working with dogs for about three weeks and training is going very well. Garmin Sport PRO works as advertised, no problems with initial setup or during training. Our main intent was to be able to allow the dogs off lead on hikes with the confidence that we could recall them as needed, and we are well on our way to realizing our goal. I bought this unit as an upgrade to a previous e-collar that I used exclusively on my Coltriever. My older, smaller Cairn Terrier had developed some crazy behavior over the years when we encounter other dogs on walks, or hiking so I wanted to make him be better - ha! Well it worked amazingly well, I do not use anything but the vibrate and the tone, and his behaviors have changed all for the better. Who says you can't teach an old dog new tricks?! Also, I only wanted to hold one handheld controller, and this sport version is a good size and easy to switch between dogs. I am sorry I waited so long to do this! Love the remote and ease of use. The bark collar and lights are excellent features! Love it so far! Much better quality than what you will find in Petco. Great features for the money! I like the ability to control 2 collars with one control as well as turn on lights, bark collar, vibration and tone! All around, great collars! Great collar and control. Would love to see Garmin make it easier to attach our own lanyards. Also, stimulation wheel is easy to adjust, but would be better if device remembered last setting for each dog rather than have to flip selection toggle and turn stimulation dial when correcting multiple dogs. Battery life is good and collars are rugged and water right. GDS is great to buy from. Good stuff, fair prices, fast shipping, great service! Love the various options other than shock therapy, like the tone and vibration. Great Product. Have had the Tri Tronics Pro 500 in the past, but love the addition of the bark limiter on the Sport Pro 200. This collar is everything Steve said it was. Excellent and easy to use. Love it. I love the lights on the collars makes it very easy to keep track of the dogs on night walks. "Wouldn't trade it for any other training system"
Bluetick Coonhound. Hunts. Family pet. Very very very good system. Wouldn't trade it for any other training system. "Very easy to use, one hand operation is great." Very easy to use, one hand operation is great. The LED lights are great for early morning decoy deployment. The idea of waterproof controls works well in Oregon. The barklimiter has stopped my dogs only bad habit. 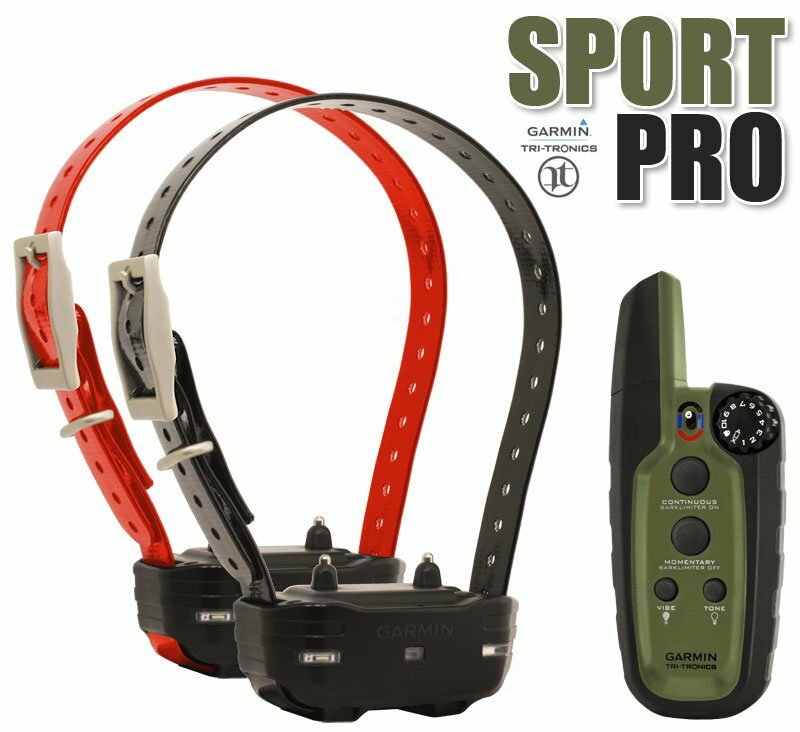 I highly recommend this collar for active dogs and hunters. Easy to use. Good fit. Very happy with product. Lots of features. Thanks for recommending. "I love the simplicity of it!" Have only used it a couple times since I just got it, but so far so good! Love the simplicity of it, and the build quality seems great. Easy and very intuitive to set up and operate. The dogs almost train themselves. Great product. All the features of the proline at a lower price point. Easy one hand operation. The only down side is only 10 levels of adjustment. Would prefer more, but it gets the job done. Nice size transmitter. Love the lights on the collars. Seems to be a great starting point before stepping up to the more expensive Pro 500 model. The Garmin Sport Pro has brought my dogs to a better level to commands and just having fun. The younger one was a bit mouthy and would try to rule. Now she has more respect. Thank you so much. Easy to use good features for two dogs. "Easy to use and very effective!" I've been using this collar on my dogs for about a week, but so far I love it. Easy to use and very (very!) effective. My dogs respond to level 4. They are completely oblivious to levels lower than 4, and actually didn't respond at first until level 5. Once they realized what was going on, I was able to reduce the level to 4 and still get consistent responses. I've been able to walk one of them on leash (who is dog-on-dog aggressive) without fear that he will go Cujo on another animal who passes by. He gets a reminder stimulation and stops all antics. It's amazing. My other dog is getting reminders that he does not need to eat every pile of dog poop he locates (which he does indeed hunt for like a pig hunts truffles). I know these are not standard reasons to use the collars, but wow.....they work, and what a relief! My dogs are only 1 year old, but I hope to be able to run them off leash soon, and will also use these collars as a deterrent against their prey drive when off leash (deer-squirrel-furry creature chasers). Definitely recommended! Thank you! "I like all the options." I like all the options on them. I haven't been able to use them a lot yet. The led lights will be awesome while camping. Really straightforward to use even when using 2 collars. Has more features than I really needed but I am pretty sure the anti bark could be handy and the light is cool to have available. I love it! The collar has really improved our black lab and hound dog's obedient issues. Being able to control both dogs from one handheld device is wonderful. My favorite special feature is the ability to remotely turn on the collar's lights to see where they are at at night. "After the first trip out, I was confident that I'd made the right decision! " The collars and remote perform just as I'd hoped. I love the remote toggle to switch between my two dogs and the one handed operation is awesome. After the first trip out I was confident that I'd made the right decision and picked the right collar combination. After a few days of no barking and she is a total pleasure to work with. We had been using the Tri Tronics collars for the last 9 years without issue. This new version from Garmin has a few more bells and whistles as well as being is a bit more lightweight. So far no issues. We like the separate button for toning the dogs, which we use frequently. The collar lights are a nice touch. Other than making sure we know how to use them, we have not needed them. Hoping the new collars last as long as the first set. We will see. "I'm happy with this purchase." Overall I'm happy with this purchase. I just wish the vibe and tone buttons had a differentiating feature. Easy to mix them up. - The dual charger that came with the base system does not consistently charge both the collar and the controller simultaneously. I often have to charge each collar on the dedicated collar charger received with the second collar. This requires longer charge times and longer times the dogs go without the collars. "This collar is perfect for my needs!" This collar is perfect for my needs. I allow my dogs to roam at our ranch in the Texas hill country, so I have trained my dogs to come to me when I use the tone. The vibrate mode gets their attention for when they do something wrong and they go to their beds. I also use the vibrate as a second measure if they are chasing an animal and the tone isn't working for recall. I have a 99% recall with the setter using the tone. The lab is still a puppy so we are still working on him. The stimulation will get the labs attention, although I only use the stimulation in certain situations; for example, if he goes after a skunk.... I gave this remote 4 stars because I think improvement is always necessary. Two examples for me; (I hope garmin is reading) a button that works for all collars instantaneously that can be set to any of the three modes you would need. (Tone, vibe, or stimulate) also if they could create a way that each collar would have a stimulate adjustment. For example my lab is crazy tough, if I have stimulation set to 4 he doesn't feel it. The Irish setter jumps out of her skin at 4. So when I need stimulation for one particular dog in an emergency situation, I don't have time to switch the dial to a number good for that particular dog. I'm sure I could think of more things they could improve on but for me those two issues are minor. The more time I have with the remote the quicker I'll become at those last minute on the fly changes needed to recall my favorite kids. One more thing, the remote lights is genius, super bright and it's perfect to see my dogs on a night with no moon. I hope this review helps someone. This collar isn't perfect but it is the exact thing I needed for two dogs that I allow to roam off leash. I like to view my dogs as a family member. (They really are my favorite kids) so if a dog is a chore running out the front door, not coming in when called, jumping on you and guests all the time, they become more of a burden to me and not necessarily a family member. Our families life doesn't have time for a dog that needs to be on a leash at all times. We live outdoors and want our dogs to enjoy the outdoors as dogs should. "Good product for the money!" Works just fine. Dogs do well with it. Good product for the money. Disappointed it didn't come with a nice carrying case. Last one I bought several years ago came with a plastic case with enough room for everything including chargers. Can't imagine it would cost much more to add the case or at least a canvas bag. "It is a fine product." I probably should give it 5 stars, but I'm still on the learning curve. I'm still used to my old Pro 1000 and Pro 100. But since I'm not doing real serious bite work etc. I opted for the Sport Pro. It is a fine product. Momentary stim does not work well. Charge system awkward. See all the Sport PRO product details here. Country of Origin: Made in Taiwan (system) & China (strap, charger, accessories).